It’s summer time, and you know what that means… SALADS! I basically live off salads during the summer, and I know you probably don’t want to stand around grilling all day, so roasting vegetables is a great alternative and gives amazing flavour to the vegetables! I used aubergine and courgette, but I would have loved to add red peppers and I once made this adding caramelised onions and all I can say is that it was AMAZING (but then again, I’m obsessed with caramelised onions)! 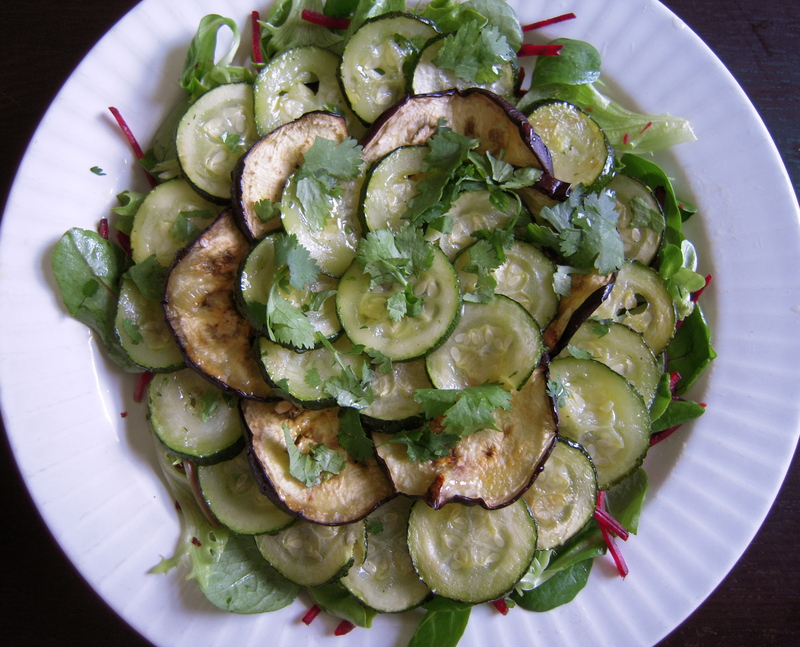 Cut the vegetables into rounds and salt the aubergine so it starts to sweat. Rinse them after about 15-20 minutes. Sweating of the aubergine is optional but recommended. Line your baking sheets with tin foil (they’ll be easier to clean up later!) and add a layer of olive oil. Put the vegetables in the oven for about 20 minutes then flip them over. Cook for another 10-15 until vegetables are soft. While vegetables are roasting, make the salad but combing salad leaves, olive oil and lemon and put them around a plate. Once vegetables are cooked, put them on the plate with the salad and drizzle with good quality extra virgin olive oil and lemon and coriander, for presentation. Love this idea for a summer dinner! I’m always looking for new + hearty salads at this time of year and this sounds absolutely delicious. Thanks Kathryn! I highly recommend adding some caramelised onions to the top, it makes it just that much better! 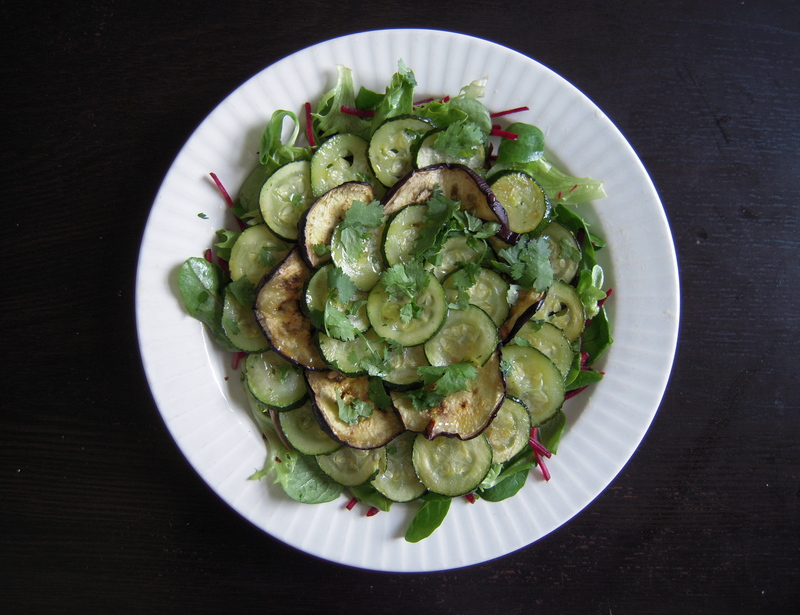 Zucchini and Eggplant, how can you wrong! I have aubergine in the refrigerator right now and I have been trying to think of something to do with it other than eggplant Parmesan. This is a great idea! This sounds amazing! I’m the same as you, I love salads in the summer- so fresh and delicious. Thanks for stopping by Jess! I’m always looking for new summer salads! I love summer salads and this one is definitely a tasty one to make! This is a beautiful salad. You make me miss summer. Oh I’m obsessed with carmalised onions too. So good on EVERYTHING…burgers, pizza, sandwiches. I don’t think I’ve ever had them in a salad though! I’ll have to try:)! Yum! I love roasted vegetables, especially aubergine! 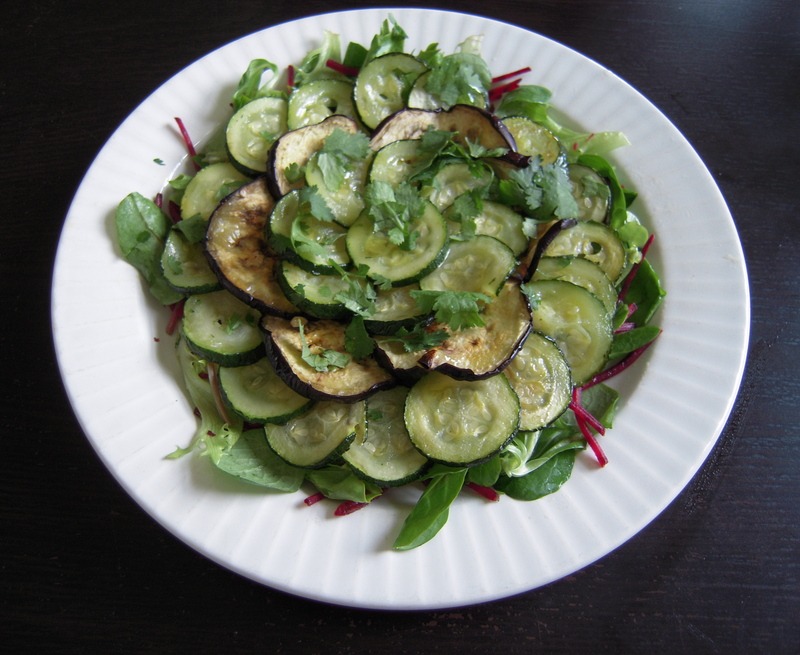 Very nice summery salad! I love your simple dressing! Thank you Nami – sometimes the simplest things are the best! With the crazy heat waves, yes, salads are a must to have around! But I absolutely love roasted veggies in my salads, too, so delicious! My boy and I roasted some veggies (aubergine and courgette) in Tunisian spice blend aka Tabil, so good on yummy dill rice or something else. Your roasted veggie salad looks delicious and savory, mmmm! Tabil sounds amazing! I’ve got to try and find that somewhere! what a great recipe, definitely will be making this. thanks. Thank you Thalia – hope you enjoy it!